Learn More about Resources in CoreAtlas. What would you like to know about Resources? I "favorited" a Resource. Why isn't it showing up on a Quest? A resource must be TAGGED with a specific Map and Quest first. Watch the video on the top of this page to learn how. How can I see which Quests have Resources tagged to them (and which don't)? When you're in the Resources page, click Show Tags in the top left corner of your screen, then select a Map. You should now see all Quests from the selected Map. Any Quests with a heart next to them have tagged Resources (hover over the heart to see how many). Open your Main Menu by clicking your avatar (top right of screen). Click Resources. Click the blue + (it'll turn pink) in the bottom right corner of your screen. Enter the resource link (URL). Select FREE or Restricted. Click Next. Select your preferred image for the resource, or use a computer generated image. Optional: Edit the title or description of the resource by clicking the blue pencil. When satisfied, click Save. Click the blue pencil next to TAGS. First choose the MAP you want to tie the Quest to. Now that you've chosen a Map, you can select a specific Quest (or Quests) - these tags tell CoreAtlas to make this resource appear on particular Quests. 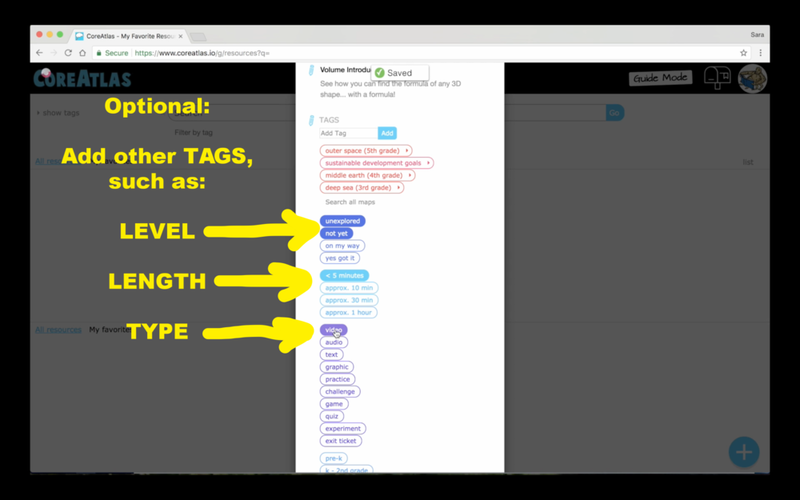 Optional: Click back to select other TAG options, such as level, length, or type. 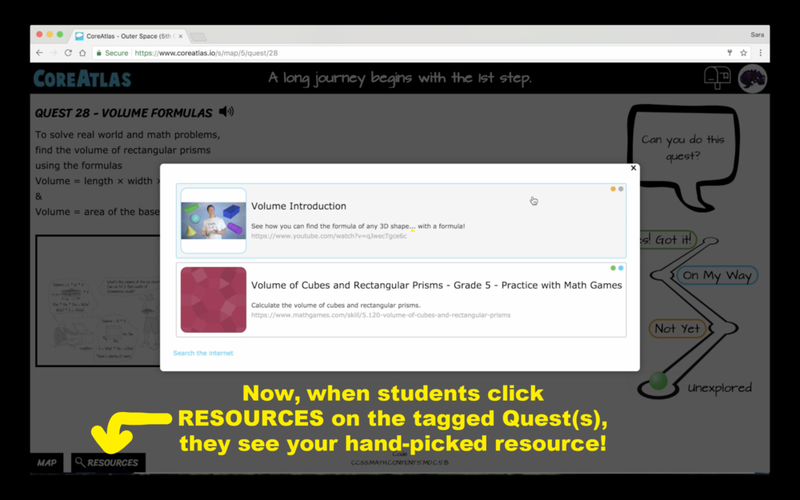 Now, when students click Resources in the bottom left corner of that Quest(s), they have access to your hand-picked resource!